Personalized 2 Line Granite Sign with Emblem - - and decorative roman italic font. Wall mount or attach to lawn stakes (sold separately, item 71731F). 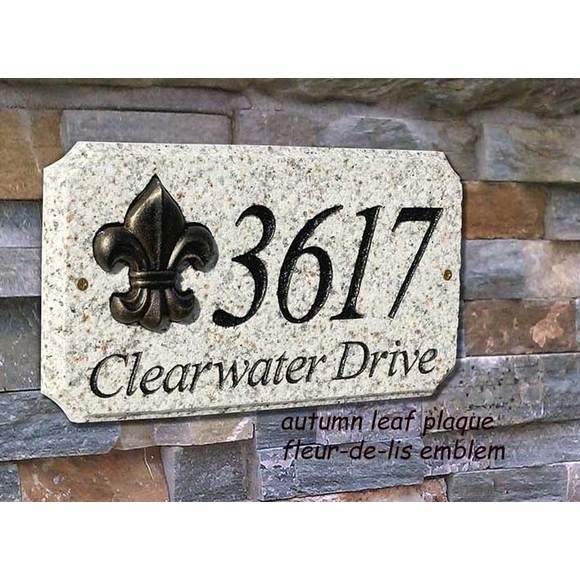 Address plaque made from solid granite includes a fleur de lis, oak tree, or scroll cast aluminum emblem. Cut-corner rectangle plaque features a graceful roman italic font and black powder-coated emblem finished with gold antiquing. Granite colors: autumn leaf natural or black polished. Number/letter color: black or gold. Emblem: fleur-de-lis, oak tree, scroll.